The end of this year is really flying by. I have no idea where October went. One day it was September, then it was Halloween and now it’s already the second week of November. Thanksgiving is coming! Christmas is coming! The weather we’ve had lately has really left me all out of sorts with the holidays quickly approaching. I vaguely remember some colder (more seasonally appropriate) days in September and October that prompted me to switch out my summer clothes to fall and winter ones. And then it warmed up again. This past Friday was nearly 80 degrees. I’m not complaining AT ALL. The longer I can wear flip flops the happier I am. Anyway, that’s partially relevant to the Secret Recipe Club and my chosen recipe because we received our assigned blogs back on October 12th and I made my recipe the following Saturday, which feels like ages ago. Look at me NOT procrastinating! And I think that was a particularly cold weekend so it totally fit right in with the weird weather. I was assigned to Flavors by Four, which is written by Susan and Nicole, a mother daughter foodie team. The second I saw this recipe I was intrigued. Pulled pork + chili. I immediately sent the link over to Tom and asked him if he would eat it. As soon as he said yes, I added it to the menu for the following week. There are a bunch of other recipes by Susan and Nicole that I can’t wait to try, like Crab Rangoon Stuffed Mushrooms (which I think will make my Christmas appetizer menu), Mini Gobbler Pies (made with Thanksgiving leftovers that I am totally making this year) and these Dark Chocolate Cherry Muffins that Tom requested I make. Note: This recipe takes 12 to 18 hours. Please plan accordingly! 1. Combine the brown sugar, salt, pepper and onion powder together in a small bowl. Rub all over the pork. 2. Place the pork in a 6 quart or larger slow cooker and pour the beer around the pork. Cook on low for 8-10 hours or until pork can be shredded with a fork. 3. Shred and set aside. 1. Add garlic through tomato paste to the slow cooker. Stir in the shredded pork. Add the remaining spices and cook on low for 4 hours but up to 8. 2. Serve the chili with additional toppings if desired. If you like your chili with more vegetables and beans than meat, I would only use half of the shredded pork in this recipe. You could buy a smaller piece, or freeze the pulled pork for another use later on. Tom thought this was the perfect amount of meat to vegetable ratio. We both thought the flavors were great and ended up eating it again the next day for leftovers. This recipe makes a ton so be prepared to freeze a bunch of it! 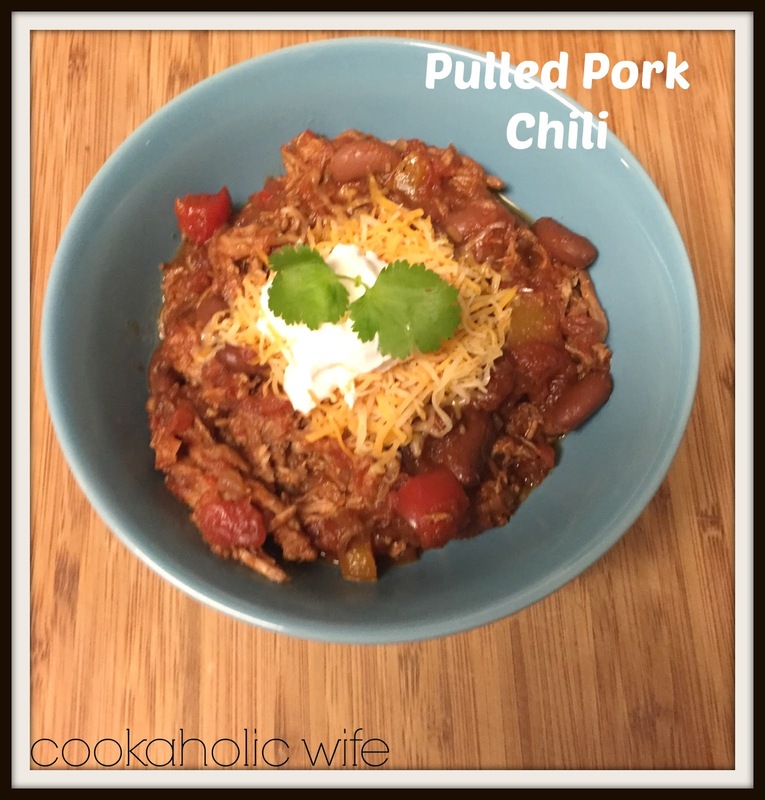 Pulled pork chili!!!! I am on board! Perfect for those chilly days and Sue to bed delicious. Pulled pork = awesome. Chili = awesome. Pulled pork + chili = genius! I've never thought of combining pulled pork and chili, but this sounds like a wonderful combination. Just stopping in from Group C to say great SRC post! This looks amazing! 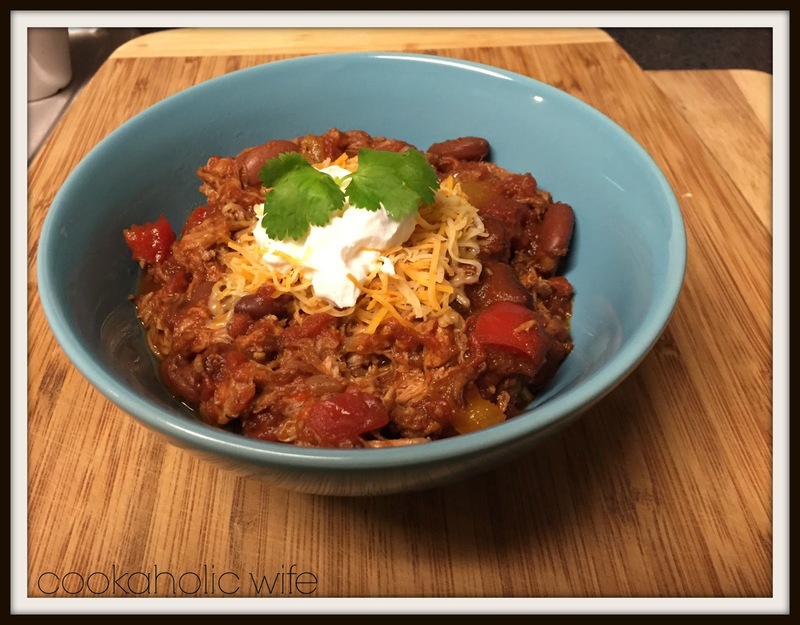 I'm always looking for another fantastic crock pot recipe! I'd never thought to make a pulled pork chili, but it sounds like a wonderful idea! And I'm with you on the weather – it started cooling down, so I prepared for colder weather to come, and now it's warmed up again! Weird weather this year. What a great way to repurpose leftover pulled pork!! This recipe is like two in one!